Babalwa Mankayi’s way into farming was sparked by a key moment at her home in Khayelitsha: One day she put some old sprouting potatoes into the soil outside her home. After a few months she was more than surprised that new potatoes had been growing at this very place without any effort on her part. 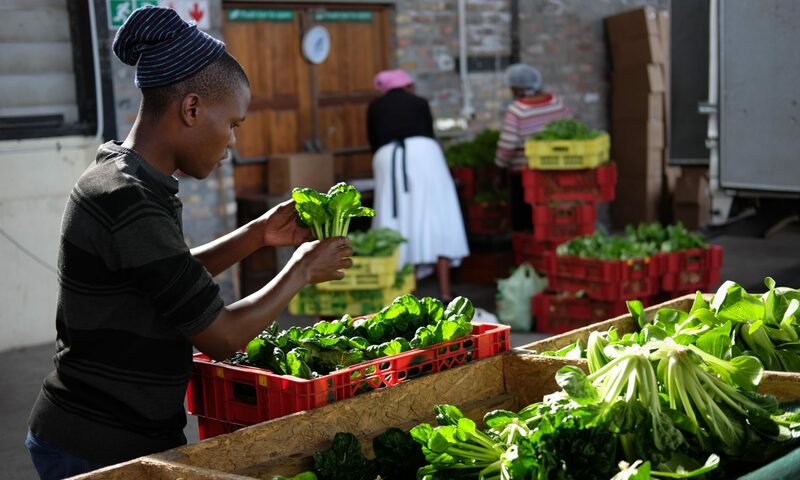 In 2015, Babalwa attended the Abalimi Young Farmers Training Centre Apprenticeship at SCAGA (Siyazama Community Allotment Garden Association) in Khayelitsha. While studying at SCAGA, Babalwa was able to obtain her own garden beds at a large community garden very close to her home in Khayelitsha. After only 1,5 years of being involved with Abalimi, the mother of three is a successful farmer of Harvest of Hope. Also her husband Gerald found a job as a driver, delivering vegetable bags for Harvest of Hope. Additionally she has been selected as our newest and youngest fieldworkers Of course she will still carry on growing and selling vegetables as well.